At my first SCBWI conference I had a portfolio review with an editor who loved my painted stuff and my digital pattern-work, but found my mixed-media approach "too photoshoppy". Can you help me define the issue? I can see that some of the brushes I chose were too hazy. Do you think that's what they meant? I'm planning to re-do this layout as the box came out too close to the gutter, but aside from that... Thoughts? This work is quite lovely and I think you may even consider ignoring such a feedback - there are some people who have an adversion for digital art in children´s book and I´ve met my share (I work fully digitally). I think what triggered the comment here is, to quote a phrase by Lee White, “the consistency of mark-making”. That can be a common issue in mixed media work and also when you use too many different brushes on a fully digital work. I think your painted backgrounds are great, but the foreground element doesn’t have the same kind of brush-work and looks a bit “pasted on”, particularly the light effect. To address that, you need to find and use a brush and color treatment that mimics the medium you use on the backgrounds: if you mix colors on the canvas, you need to do the same with your digital canvas. It seems you use oils, and there are some lovely “oil” brushes in photoshop, even some that use the “blender brush” engine, which blends colors in a way that recalls oil behavior. “Color variance” in the brush setting is another very useful tool. It can also help if the traditional work process is imitated, especially at the beginning. It can be risky to use all the nice digital tools (layers, color fills, bright saturated colors, etc..) until you know how to achieve a traditional look (if that is what you want). If you work as if you had a real canvas in front of you and use brushes that mimic traditional media, you can create digital art that looks indistinguishable from traditional media. I think his comment meant to point out the paper cut out quality of the illustration. Also that only some pieces look outlined, some objects are only partially outlined. and light doesn't fall off as you move away from the light source. 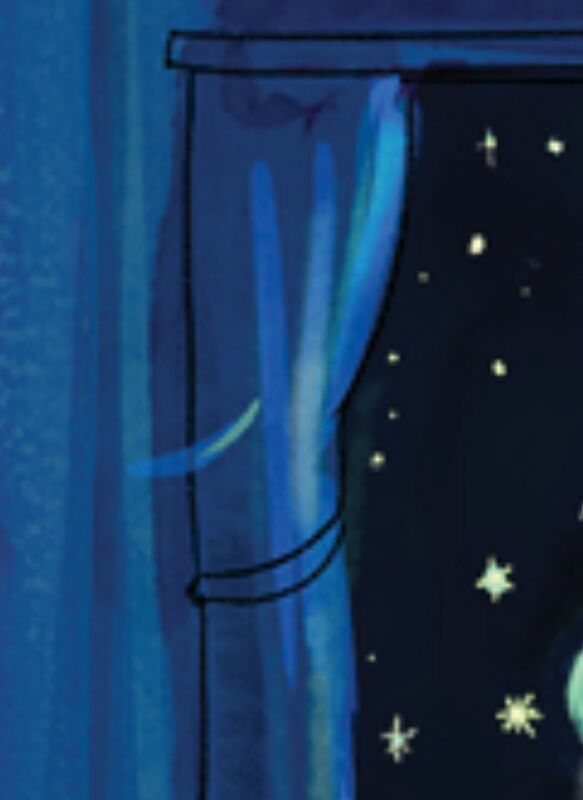 If this is a style you like and want to develop then it's ok, but if it's not something you like you may want to make the illustration look more painterly and less flat of course with more consistency as smceccarelli said. From a distance it looks like you used a stock airbrush, particularly on the shading of 'twinkle 2'. But when I looked really really closely it looked more like hard edged watercolour strokes which is probably closer to what you're looking for. If you're going for a watercolour texture look, I would try and make the texture a bit more obvious. Bigger, perhaps? Literally yell 'this is supposed to look like watercolour'. I don't use photoshop, so I'm unsure exactly how to do this (I use painter). Good luck! Mastering digital as a medium is one of those things that's deceptively difficult. Overall it's a cute piece of art! Thank you for the excellent, pointed feedback. I think I did get too excited using all the fun Kyle brushes! I work mixed media typically with acrylics, transparent mediums (meant to mimic oils! so meta! ), ink, and other water-soluble pencils, etc. I'll look into the oil brushes too. I really, really miss my brush strokes, happy textural accidents, and watercolor edges, though, so that's been a struggle to reproduce digitally. But gosh the ctrl + z... it's so nice to be able to undo. @heidi-ahmad yes, I love paper cut in my work... I guess it's not reading clearly or intentionally enough to pass in this digital form. Yes, I had the same note about lighting as well which I will take into account in the re-do. @Art-of-B I was using a myriad of brushes from the Kyle T Webster brush collection in Photoshop. I like working with cut/pasted pieces in my analog work, but it looks a bit weird in this form. Thanks for taking the time to comment!! I appreciate it very much. First of all, your artwork is fabulous. It is magical, whimsical, fun, and communicates an intriguing story. That's why the comment you received at the SCWBI conference is so disturbing. Anyone who offers a critique that leaves you feeling as if you were just (figuratively) "kicked in the stomach" has other issues and, therefore, as others have suggested in this forum already, you should just ignore them. BUT, we all know that is easier said than done. That's not to say that critiques from those with your best interests at heart should be ignored. I truly think your work is very good and any flippant comment about it being "too photo-shoppy" is simply not going to help you in any way. In fact it could hurt you, discourage you, and derail your ambitions. ULTIMATELY, the BEST critic of artwork for a children's book is a child. Read that again: THE BEST CRITIC OF ARTWORK FOR A CHILDREN'S BOOK IS A CHILD! Ha! I just ticked off every agent, art director, editor, and publisher. But, trust me, if a child is mesmerized by your story and illustrations you have succeeded. Both Thomas Kincade and Norman Rockwell were heavily criticized in their lifetimes but THEIR AUDIENCES adored their work. Meanwhile, Andy Warhol is considered an art "god" and he painted soup cans. Go figure. But, still, it is ultimately his audience that matters. My taste doesn't really matter. And THAT is my point. Your audience is who needs to appreciate your work. So, take heart, I've seen a lot of children's books and been to a lot of readings of children's books and when a child is engulfed in every word you have written and in every illustration you have painted you have a hit. Just to backtrack, I'm sure the best agents, publishers, etc. agree with this and make every effort necessary to look at stories and artwork through a child's eyes. It is asking the impossible to ask artists to grow a "thick skin" to ward off negative or thoughtless comments. If you weren't sensitive, you probably wouldn't be an artist. So, I hope this helps. If I reach you in only one way with this writing I hope you can rest assured that your artwork is wonderful. I'm not sure what Photoshop-py means as a critique exactly and would have asked for more specifics. However I recently listened the Podcast about critiques you should check that out. One of the things they mentioned was if you hear a critique like that and don't quite see what they're saying, keep showing your work around and see if you hear more of the same. If you do then take a look at what you could change but if not, it could just be that one persons preference. I don't see what he is saying personally. I would suggest getting some more input and see if you hear similar things before trying to change your work flow. Great work! @larry-whitler Thanks for the words of encouragement. Interestingly, I have a pretty thick skin having been a designer for a long time. The critique was not discouraging for me, but rather puzzling. I thought I understood what the reviewer meant, but after sitting on it for a month or so, I wasn't sure anymore. So posting here was putting it to to the peer-review test. I am always happy to learn and improve, and I know I've got a long way to go with the digital paint. But, in terms of progress, I've already submitted 2 dummies to workshop and am working a bunch more... I keep on truckin'. I’m not sure what Photshop-y means either. I don’t see it in the paint. Maybe this person found the few black outlines, such as around the boxes, stand out a bit among the more painterly look? As in, inked versus painted? It’s a charming image at any rate, and I think you’ve gotten some great advice above. @riftweaver Thanks for taking the time to respond. I think that might be nice to hand-letter the text. Thanks for the insights. @shiggins180 Hi thank you for your reply. Which podcast are you referring to? The SVS one? @adriana-bergstrom Yes the 3 Point Perspective Podcast, episode 10. Here the link to the post they put up about it http://forum.svslearn.com/topic/6202/episode-10-critiques. Lots of great info on how to get and give critiques and how to use the info. @shiggins180 oh! I don't know how I missed that episode. I thought I was all caught up. Thanks for the link. To take it to the next level maybe try experimenting with different brush shapes, or work in more detail with a smaller brush to get rid of the round brush shapes. Again, take all this with a grain of salt because I probably have no idea what I'm talking about.